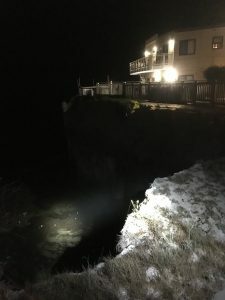 Just before midnight, last night, September 14, 2018, the Santa Barbara County Public Safety Dispatch Center received a report of a cliff fall in the 6700 block of Del Playa Drive. Several reporting parties said a female college student fell from a balcony and landed in the water. One witness said the young woman was sitting on the balcony when she fell backward over the cliff. Sheriff’s Deputies and UCSB Officers assigned to the Isla Vista Foot Patrol responded as did Santa Barbara County Firefighters who dispatched a swift water rescue response. American Medical Response paramedics responded as well. When emergency personnel arrived, they located a 20-year-old Santa Barbara City College student on a kelp bed located below the balcony. She had been placed there by bystanders who pulled her out of the water. She was transported to the hospital with injuries. The extent of her injuries is unknown. Alcohol is believed to be a factor in this incident. The Sheriff’s Office wants to remind students, residents and visitors in Isla Vista to use extreme caution on balconies and near the cliffs. Throughout the years there have been fatalities and life-changing injuries that have been the result of people falling from the cliffs. In a majority of these cases, the patients have been intoxicated.